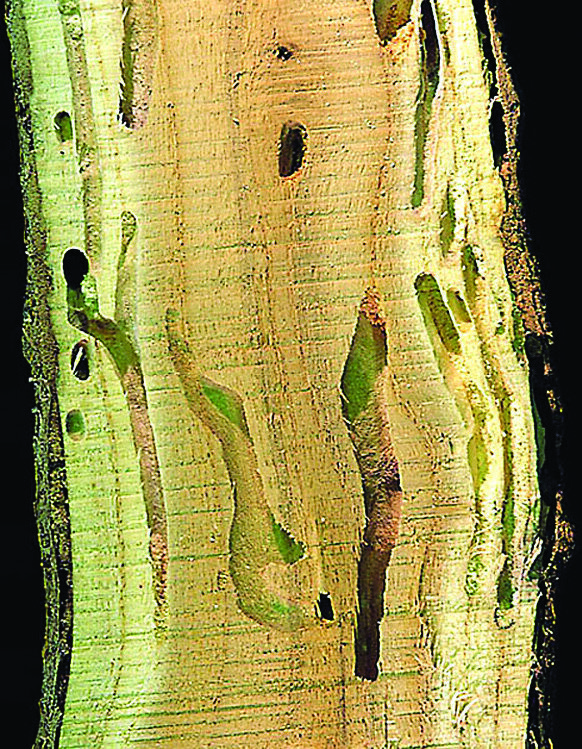 Emerald ash borer (Agrilus planipennis, EAB) is not the only wood-boring insect that attacks ash trees. 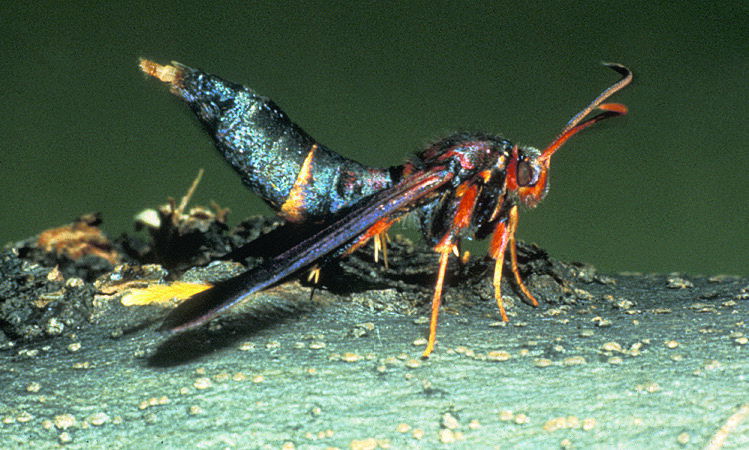 Several native clearwing and roundheaded borers also commonly infest ash. That’s why the ability to distinguish EAB infestations from those of native borers is extremely important. 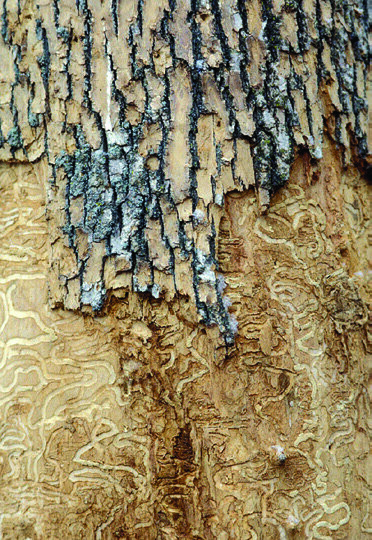 Indeed, virtually every declining or dead ash tree will be at some point colonized by native borers, which attack weak, dying, and freshly killed trees. 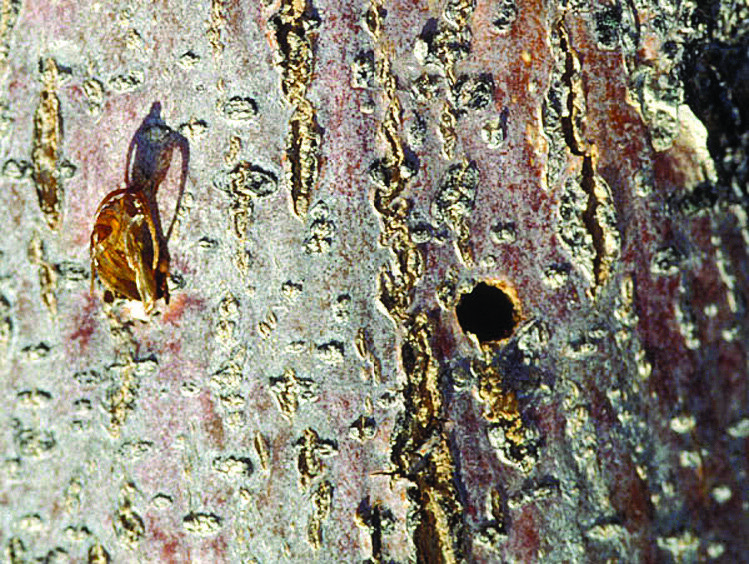 Although many signs and symptoms of native borers resemble those of emerald ash borer, there are several important characteristics that are useful in distinguishing native borer infestations from those of EAB. Of particular importance are the nature of the galleries and the shape of the exit holes, which are distinctly different. 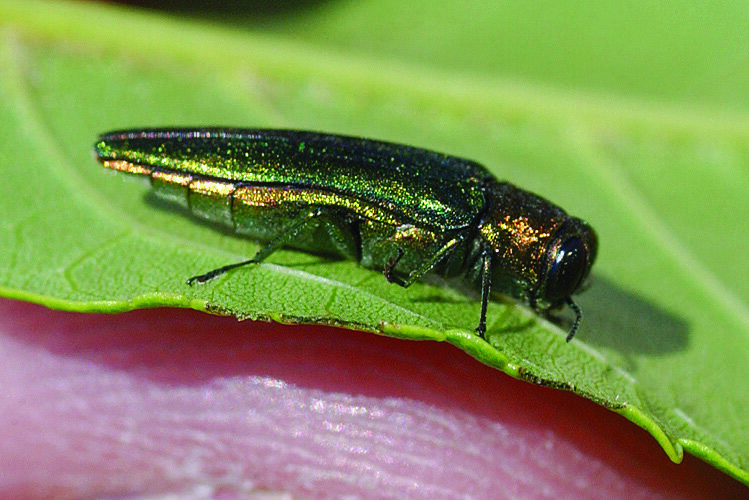 This fact sheet provides information about the most common native ash borers, as well as photographs that will help you identify which insect is attacking your ash tree. Remember: Finding wood borers in a declining ash does not mean the tree has been infested by EAB. Dead and declining ash are almost universally infested with native borers. Among the most common of the native ash borers are the banded ash clearwing borer (Podosesia aureocincta) and the ash/lilac borer (P. syringae), both of which are the larvae of clearwing moths (Order: Lepidoptera; Family: Sessiidae). 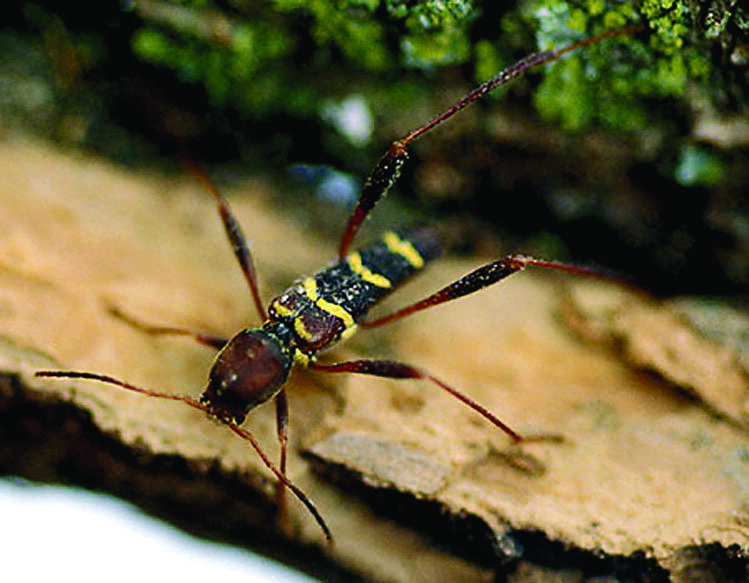 The banded ash clearwing borer has become especially common in Ohio’s urban forests, where it attacks stressed trees. Banded ash clearwing borer adult. David G. Nielsen, OSU/OARDC Banded ash clearwing borer frass around tree base. Clearwing borer pupal case and exit hole. a. Galleries: Clearwing larvae bore deep into the sapwood, while galleries of emerald ash borer are confined to the phloem tissue just under the bark. 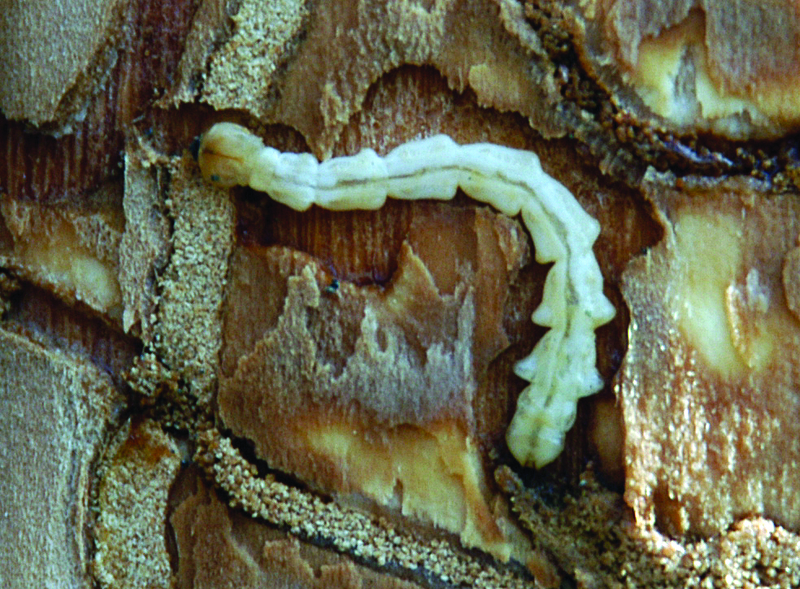 Clearwing borers expel their frass (a mixture of sawdust and excrement) from the tree; this frass can accumulate in large quantities in bark crevices, branch crotches, and on the ground, providing a good sign of clearwing borer infestation. On the other hand, emerald ash borer larvae pack their frass tightly within their galleries as they feed, and it’s not visible outside the tree. b. Exit holes: Upon emerging, clearwing borers leave behind a pupal case, which is sometimes found protruding from the emergence hole. On the other hand, flatheaded borers such as EAB do not produce such a pupal case. 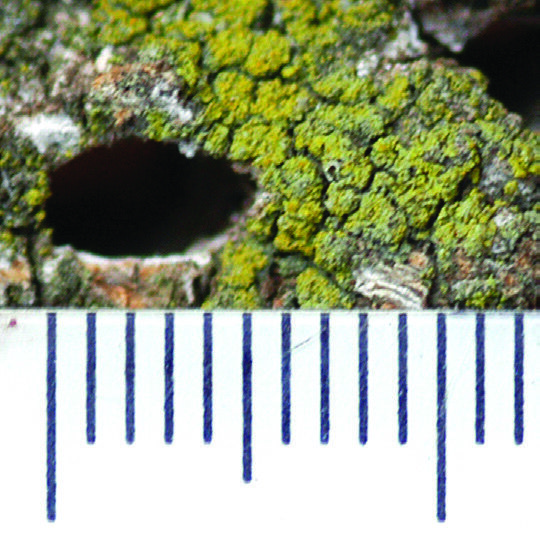 But the shape of adult exit holes in the trunk is the key diagnostic feature to distinguish EAB from native borers. 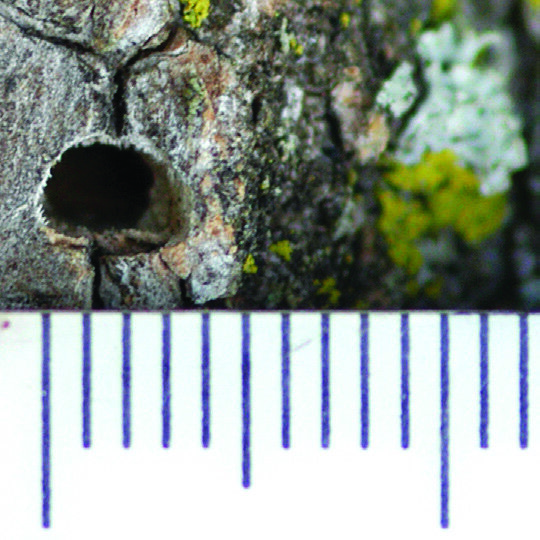 The exit holes of emerald ash borer are distinctly D-shaped and small (about 1/8–1/4 of an inch), while emergence holes of clearwing borers of ash are larger (1/4–3/8 inch diameter) and round. Because the galleries of clearwing borers penetrate into the sapwood, one can insert a thin wire through the emergence hole well into the tree. 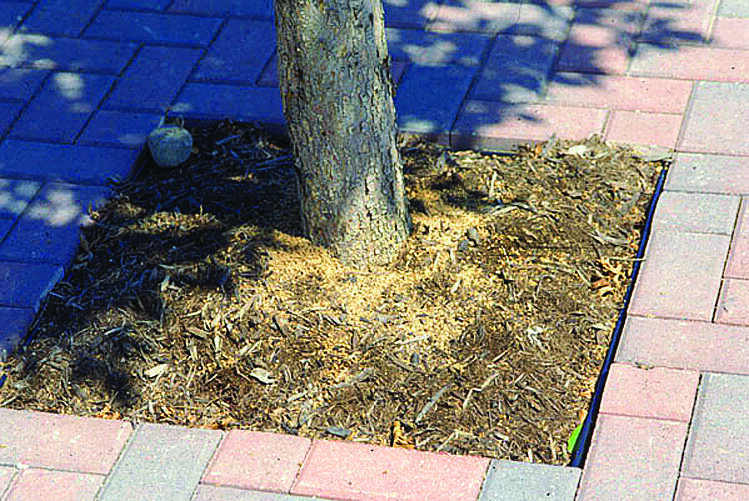 This is not possible with EAB exit holes, as the galleries wind just under the bark and are plugged with frass. There is a native species of Agrilus that infests ash, and it probably also produces D-shaped exit holes. However, this insect only colonizes small branches and twigs and is much smaller than EAB. Several species of native roundheaded borers also infest ash, with the redheaded ash borer (Neoclytus acuminatus) being the most common in Ohio. Roundheaded borers are the larvae of longhorned beetles (Order: Coleoptera; Family: Cerambycidae), which derive their name from the very long antennae of adults. a. Shape of the larvae: As their name implies, the larvae of redheaded ash borer and other roundheaded borers are more tightly segmented and round in cross section (resembling the “Michelin” tire guy without arms and legs). 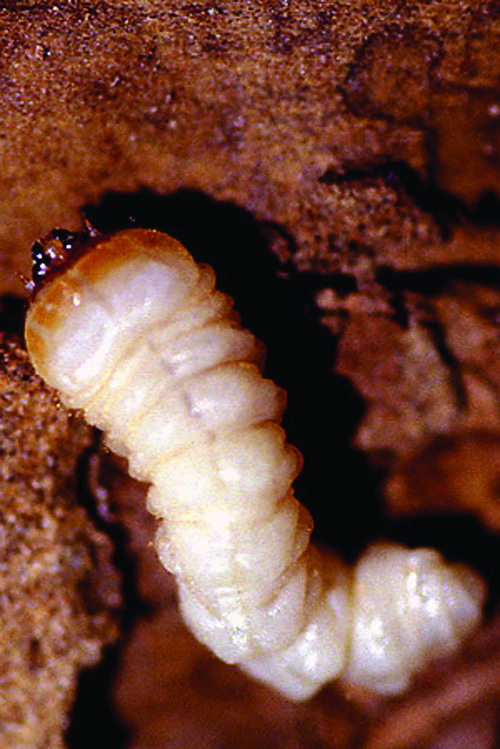 In contrast, the larvae of flatheaded borers such as EAB are highly flattened and have a tapeworm-like profile. b. Galleries: Galleries made by redheaded ash borers initially form just under the bark and are packed with frass, as is the case with emerald ash borer. However, redheaded ash borer galleries are not nearly as S-shaped as those of EAB. As larvae mature, they extend their galleries well into the sapwood, usually following the grain of the wood, while emerald ash borer galleries are restricted to the phloem. In addition, redheaded ash borers are restricted to severely weakened, dying, and freshly killed trees (e.g., freshly cut timber and firewood), while EAB colonizes even healthy trees. 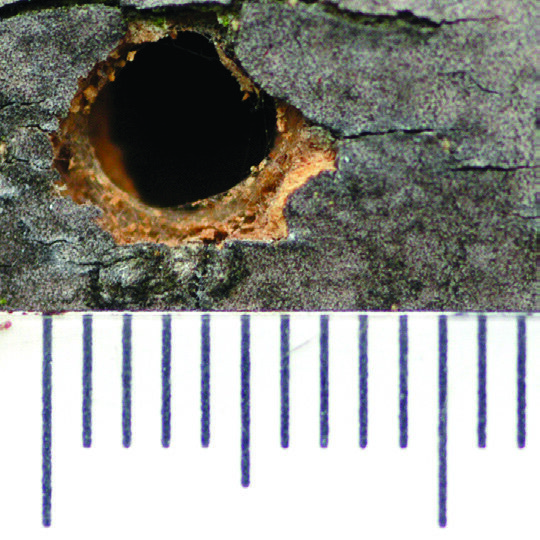 c. Exit holes: Redheaded ash borer infestations can also be distinguished from EAB by the presence of large (1/4–3/8 inch wide) oval exit holes that extend deep into the trunk.